Press the shutter, capture the moment, and watch the image develop in front of your eyes. 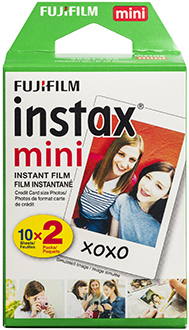 With superb grain quality, Instax film ensures vibrant colour and natural skin tones. The unique credit-card sized film is easy to carry in your purse or wallet. Every cartridge is designed and labelled for easy loading and is filled with 10 prints each.